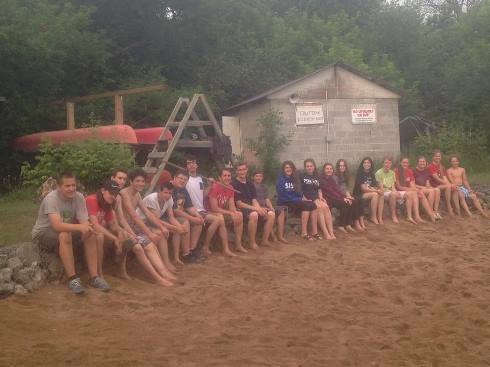 On July 3rd Albright Youth filled a bus with 19 students, 2 leaders, and our incredible bus driver Marty Ryan, and took off west to the Qu’Appelle Valley in Saskatchewan. Excitement was evident for our destination of the beloved Echo Lake Bible Camp. Before we left we invited the parents and staff to join us in a time of prayer. With the covering of Christ on our group we left excited to see how God would reveal himself yet again to our group at camp. With a six hour one way trip, Friday was a travel day in preparation for a busy work day on Saturday. we can put some good ‘sweat equity’ into the camp and help out where needed. 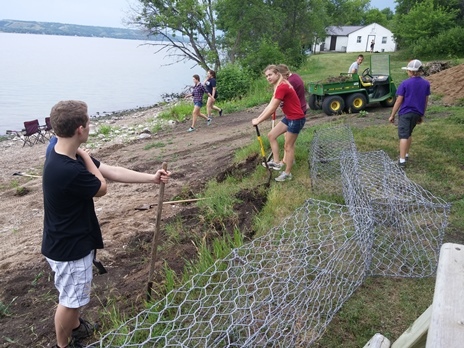 This year our group was given the task to do some preventative maintenance at the beach, so that high waters wouldn’t cause havoc in the spring. When I heard the task that was saved for us I chuckled, thinking, ‘there was no way we were going to be able to accomplish what the camp manager, James, had hoped’, but our group was up for the task. 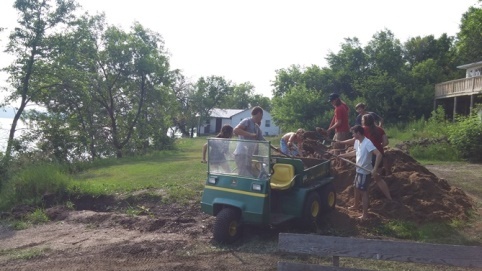 They were eager to pick up a shovel, pull weeds, haul rocks and whatever else needed doing. Even though a downpour made us take an early break, many were back out working as soon as the rain let up. needed to carve out the land so that we had a flat foundation to place the retaining wall. Secondly, we needed to place pre-made cages along that foundation and then fill them with big rocks. This would have been much easier if the rocks had been conveniently located, but that was not so much the case. We took what rocks we could from the nearby beach but, after those rocks were all used up, our group then had to go into the water, feel for large rocks with their feet, pick that rock up and either throw it to the dry shore, or carry them in. This was not an easy job and took hundreds of rocks to fill up all those cages. Lastly, when the cages were full we spread out about eight yards of sand onto the beach so it could be enjoyed with a bit more comfort. Finally the task was complete! Our Albright Youth did that job proud! After nearly seven hours of hard labour, infused with many laughs and outstanding teamwork, the task was completed just in time for dinner. No longer will the high waters wash away the land by the beach. 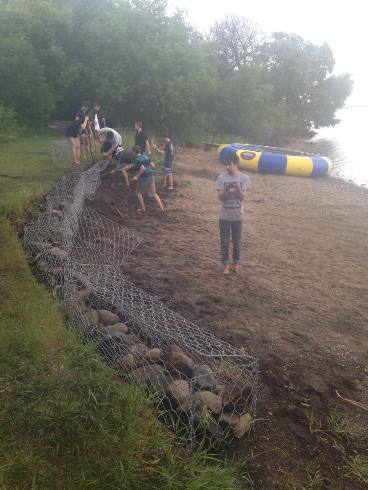 Because of this work the survival of the camp’s beach will live on for many years to come. So, what would motivate this group of young people to do this type of work? Young people love to work hard together to induce positive change. Young people have experienced God’s life changing presence at this camp so, when given the opportunity to do some hard work to help further ministry of the camp, the ask is easy and the task becomes easily enjoyed. When you get incredible youth together the hard work asked of them is an opportunity to create memories together. I am very proud to have such an amazing group of young people who bonded together to do what I thought was laughable just a few hours earlier. They put in incredibly hard work and I don’t remember once hearing any controversy. I was so blessed to be in the midst of such people. 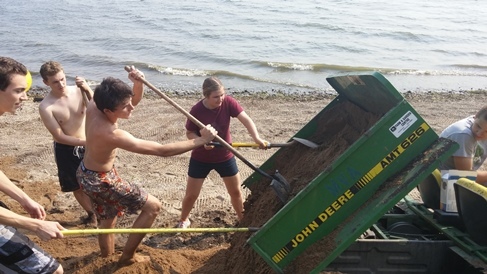 Echo Lake named the beach ‘Albright Beach’, at least for this summer, and they were ecstatic to see what had been done. In the end, we were happy to do it and every single person there knows that Echo will continue to be a place where life transformation happens because Jesus is leading the way.